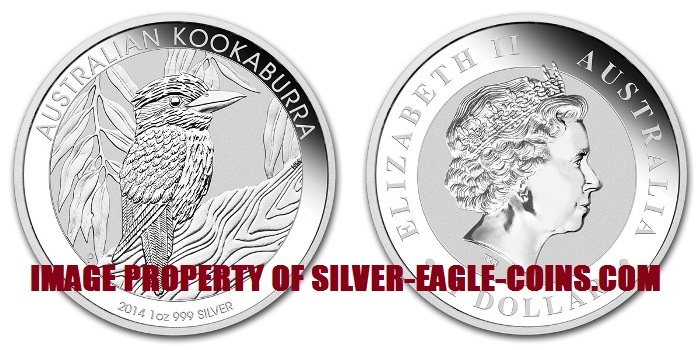 The Silver Eagle Coin Company is pleased to offer 2014 Australian Silver Kookaburra Coins. The 2014 silver kookaburra is the 25th coin issued in the popular Australian Silver Kookaburra Series. The Australian Kookaburra is the world's only silver bullion coin to change its design yearly. This design change, coupled with a very limited mintage, has made the Kookaburra one of the most popular silver bullion coins of all time. Each coin is gem brilliant uncirculated with a gorgeous proof-like finish and is 40.6 mm in diameter. Each coin contains one ounce 0.999 pure silver, with a $1.00AUS face value per coin -- making it a "legal tender" coin in Australia. Obviously, the face value is largely symbolic since the intrinsic silver value is much greater than the face value. Each coin comes in its original Perth Mint protective plastic capsule. Buy (20) coins and you will receive an original Perth Mint sealed roll.